This week’s all about Yamaha, with a veritable squadron of cool customs from every genre—including a new SR500 from Shinya Kimura. 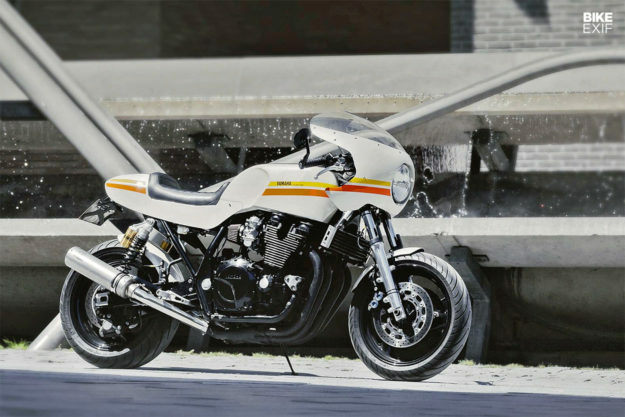 There’s also a very cool Guzzi Le Mans sneaking in from Italy. Let us know which one you’d ride home, because we can’t decide. 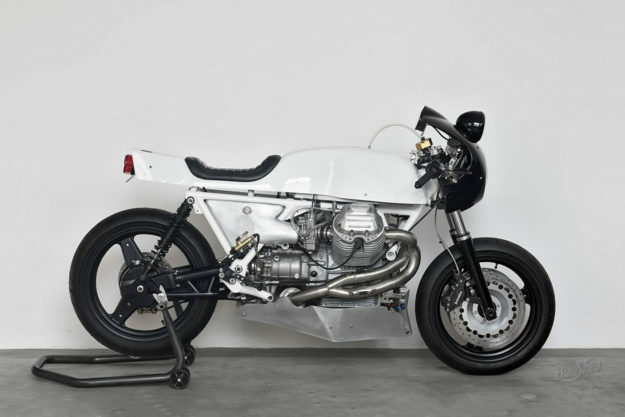 Moto Guzzi Le Mans III by Ruote Fiere Chris is far more of a Guzzista than I am, but even I can’t resist the charms of this peculiar—yet alluring—Le Mans. It’s the work of Davide Caforio over at Ruote Fiere in Italy, who’s masterfully blended a pseudo-endurance look with some sweet engineering. 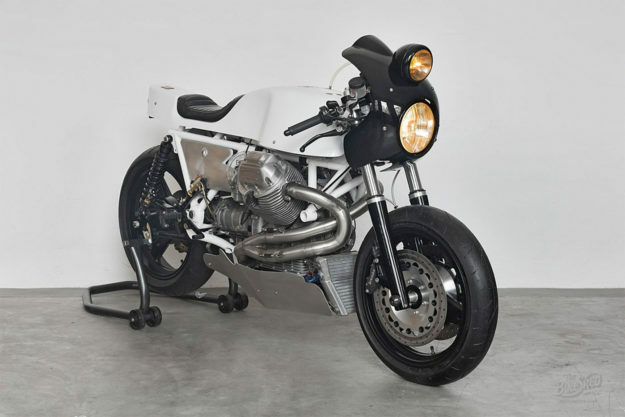 This Le Mans is packing a 1,100 cc square barrel motor, Dell’Orto PHM 40 mm carbs and a beefy stainless steel exhaust system. Adding to the list are a Silent Hektik ignition system housed in a Mandello Racing timing case, a lighter flywheel, and a Ram Racing machined clutch. Oh, and a custom oil cooler too. Davide’s fiddled with the geometry too, with a steeper head angle, and a pair of 45 mm Marzocchi forks in billet triples. The rear shocks are by off-road car gurus, Oram, and feature Öhlins bits inside. Three-spoke alloy wheels from Italian firm EPM are controlled by a custom braking system, pieced together from multiple sources. 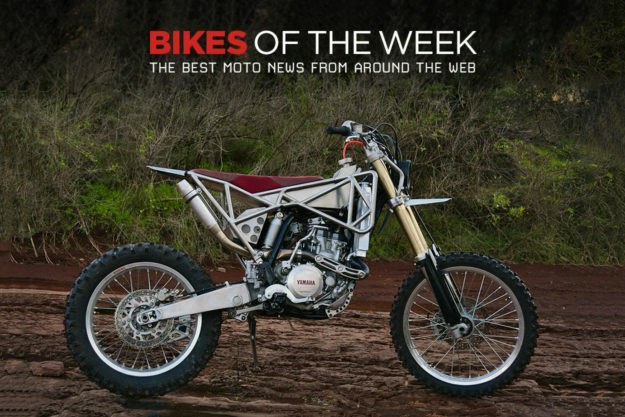 Yamaha WR450F by Le Motographe Yamaha’s WR450F is an off-road weapon of note…but can it custom? French Workshop Le Motographe, says oui. When their American client asked for a street legal, off-road custom, the Le Motographe team of Jerome and Yvan went wild. 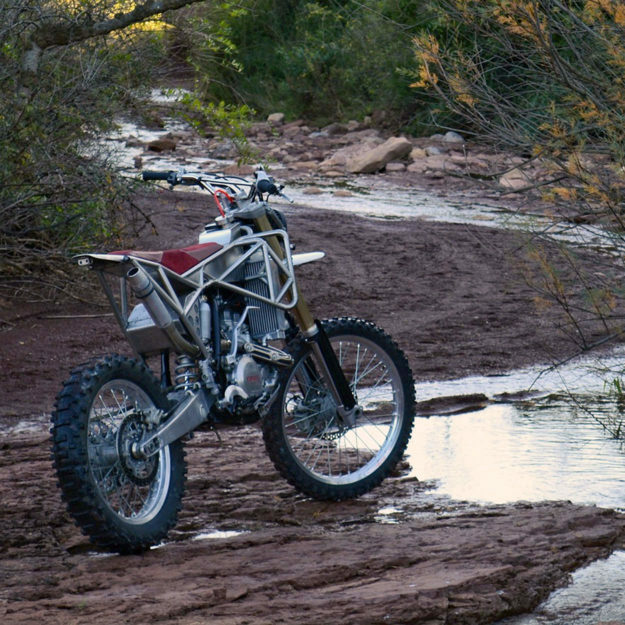 They redesigned the enduro with a hand-built exoskeleton, for a radically different aesthetic. There’s a hand-made tank sitting inside the frame, with a red leather seat and a custom rear fender. The airbox and exhaust are one-offs too, and the guys even shed a little extra weight, with a Lithium-ion battery. The changes have resulted in 10 kg weight loss, and a 5 hp boost in power. And Le Motographe have tuned the suspension too, specific to their customer’s weight. So even though this WR450F looks hella quirky, it should be bananas to ride. 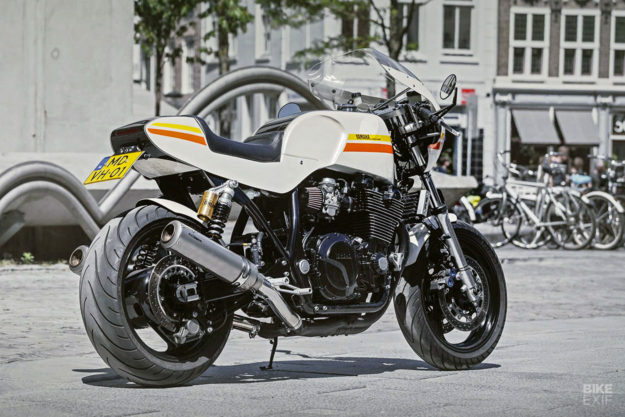 Yamaha XJR1300 by Wrench Kings The XJR1300 is one of the last true modern UJMs. This 1999 specimen has all the muscular goodness of the stocker, ramped up with a huge hit of classic racer style. And we have Dutch shop Wrench Kings to thank for that. Wrench Kings took the big Japanese four, and re-dressed it in hand-formed aluminum bodywork from The Custom Factory. Then they treated to a livery straight out of the 70s. The tail sits on a custom subframe, the seat’s wrapped in leather, and there’s an LED tail light neatly mounted out back. The team also installed Tarozzi foot controls and clip-ons, new switches, Brembo master cylinders and Daytona clocks. There’s a full complement of Motogadget-ry too, and bits like the frame and wheels have been powder coated. 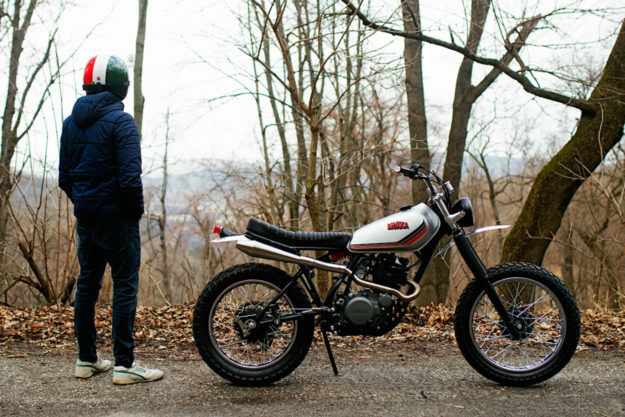 Yamaha XT250 by Mokka Cycles Budapest shop Mokka Cycles have a knack for building svelte, cute off-roaders. This little XT is one of their best yet—loaded with everything you need, and nothing you don’t. 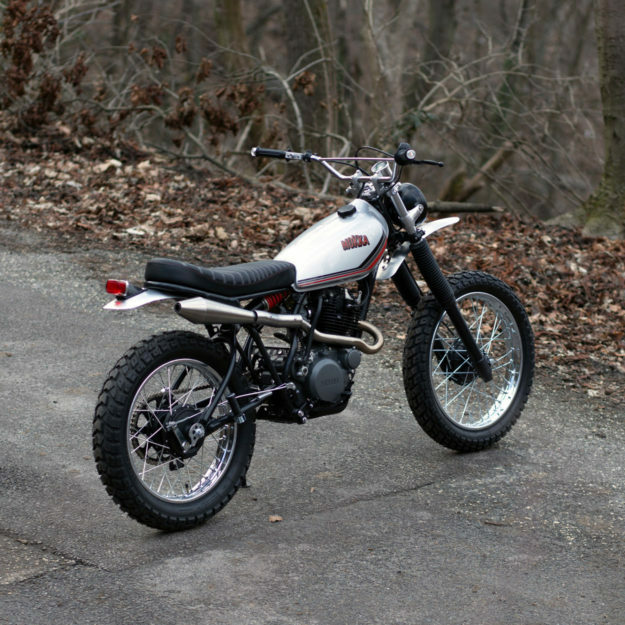 It’s a 1982-model XT250; a punchy little enduro with no electric starter, and therefore no battery. Mokka took full advantage of this, trimming the Yamaha right down to the basics. But don’t let its unassuming looks deceive you—every nut and bolt on this XT’s been touched. There’s a custom subframe and seat, custom aluminum fenders, and a clean, high-mounted stainless exhaust system. The front wheel’s been swapped from a 21” to a 19” rim, for a more balanced stance. Classic motocross bars, Mokka switches and Ceriani headlight ears round out the package. The paint is super-classy too—a riff on Yamaha’s liveries from back in the day. Mokka tell us that all they wanted to do, was build the bike they reckon Yamaha should be selling today. 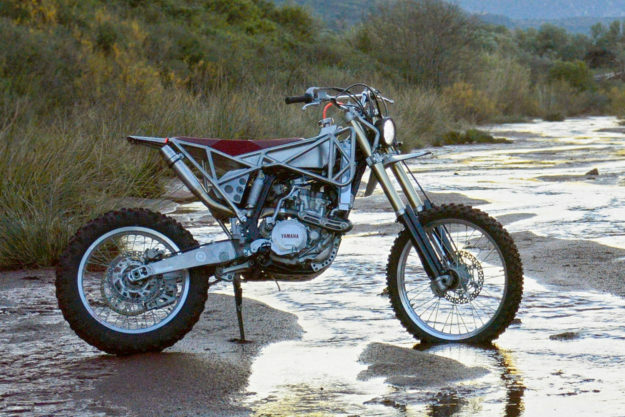 An OEM retro 250 cc enduro? Count us in! 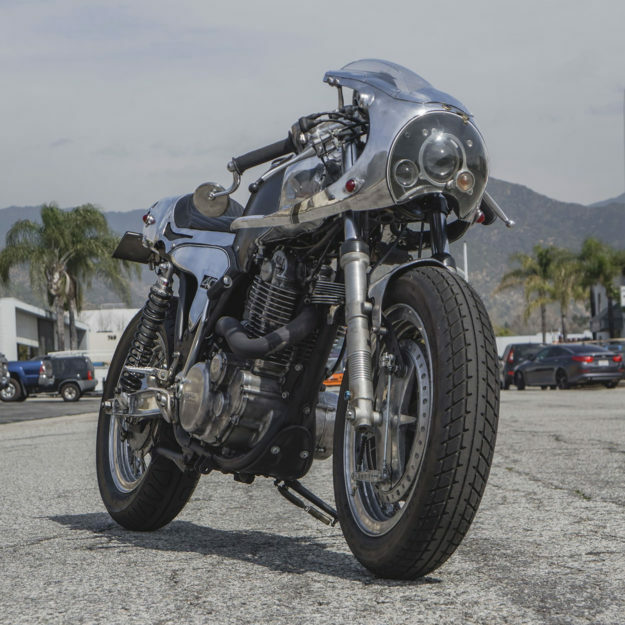 Yamaha SR500 by Chabott Engineering Shinya Kimura over at Chabott Engineering in California has made a name for himself as a master metal shaper. 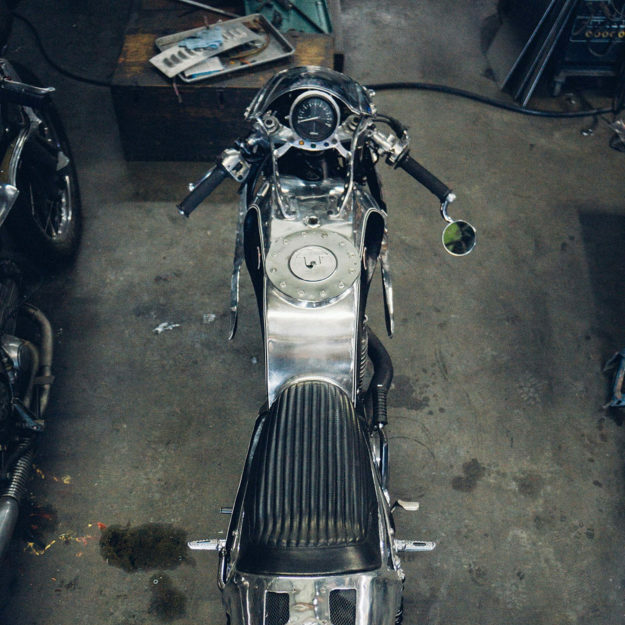 His motorcycles have a raw, asymmetrical feel—like they creeped out of his mind directly into metal. 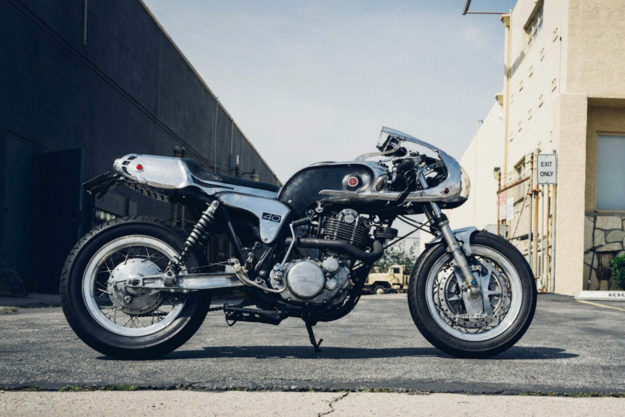 This SR500 has all the hallmarks of a classic Chabott build. Even though the individual shapes seem random, there’s a harmonious flow going on from front to back. Everything’s hand-made, from the elongated fairing, right through to the straight-through exhaust in the tail. The donor’s actually a 1978 SR500 frame, with a 2018 SR400 motor wedged in. Shinya rebuilt the motor with a new piston and camshaft, then added a Keihin CR carb and Honda XR250 oil cooler. There’s also a Kawasaki KX250 swing arm, Works Performance shocks and Dunstall forks.